This genus is accepted, and its native range is E. Medit. Perennial. Culms 30-50 cm long. Ligule an eciliate membrane. Inflorescence composed of racemes. Racemes single; unilateral; bearing few fertile spikelets; bearing 3-8 fertile spikelets on each. Spikelet packing distant. Spikelets deflexed; solitary. Fertile spikelets pedicelled. Pedicels cuneate. Spikelets comprising 2 fertile florets; with diminished florets at the apex. Spikelets cuneate; laterally compressed; 15-20 mm long; breaking up at maturity; disarticulating above glumes but not between florets. Rhachilla internodes pilose. Floret callus pilose. 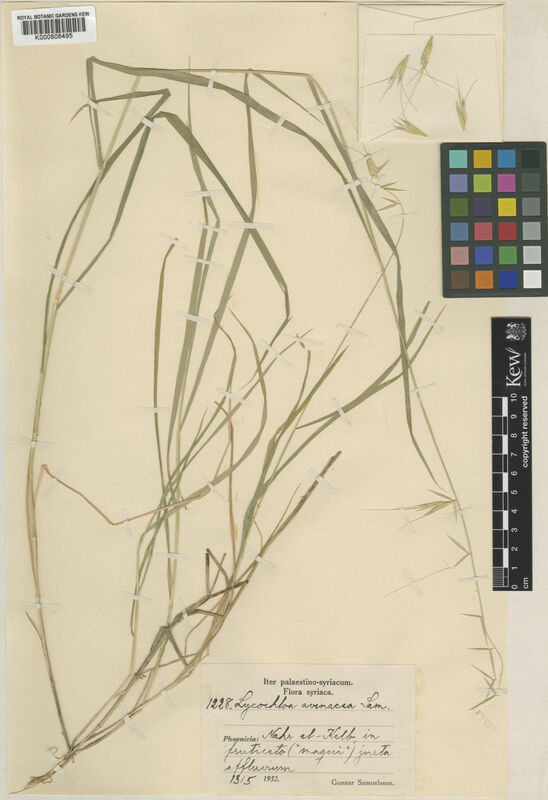 Glumes persistent; shorter than spikelet; thinner than fertile lemma; gaping. Lower glume lanceolate; 0.66-0.75 length of upper glume; membranous; 1-keeled; 5 -veined. Lower glume apex acuminate. Upper glume lanceolate; 0.9-1.1 length of adjacent fertile lemma; membranous; 1-keeled; 5 -veined. Upper glume apex acuminate. Fertile lemma elliptic; chartaceous; keeled; 11 -veined. Lemma lateral veins ribbed. Lemma apex dentate; 2 -fid; awned; 1 -awned. Principal lemma awn dorsal; curved. Palea 2 -veined. Palea keels winged; ciliolate. Apical sterile florets 1-3 in number; barren; in a clump; lanceolate. Apical sterile lemmas awned. Lodicules 2; united; fleshy; truncate. Anthers 3.